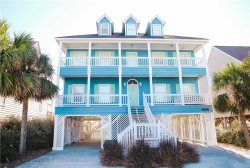 Enjoy incredible panoramic ocean views from the balcony of this vacation rental unit at the Baywatch Resort. Enjoy the Ocean Drive Difference by starting your vacation immediately upon arrival, as this property comes with fresh bed linens/bath towels, the beds are already made up for you, and the departure maid service are all included in your price. Updated in 2017 with new flooring and furniture, this uniquely appointed two bedroom condo sits high above the rest when it comes to cleanliness, amenities, location, and of course – the beach! With 2 bedrooms and a sleeper sofa, there is room for up to 6. Guests of Baywatch 1709 can take advantage of unlimited access to all resort amenities such as the on-site restaurant, indoor and outdoor pools and lazy rivers, hot tub, and updated fitness center. The fully equipped kitchen means you can feed the whole family right from the condo. The included washer and dryer make washing those beach towels and bathing suits a breeze. The living room and bedrooms each have a flat panel TV with cable, so no fighting over the remote! This condo is close to major attractions, shopping, and dining. The House of Blues, Alligator Adventure, Barefoot Landing, and the Tanger Outlet Mall are just minutes away, not to mention countless golf courses and the endless choices of food in Restaurant Row. You’ll automatically have access to our own Endless Fun Club, an exclusive savings program designed to help you get the most out of your North Myrtle Beach vacation. Give us a call to start planning your trip!